Designing Control Centers for cars of the future. Metalab's self-driving cars require an in-car interface to help passengers control settings in their vehicle. My goal is to create a simple to use in-car interface that replaces traditional hardware buttons so that passengers can operate driverless cars with ease. Since I never learned how to drive, I needed to quickly get myself up to date with modern touchscreen car interfaces as well as self-driving cars. You can check out the blog posts that I based my research on self-driving cars off of here, here, and here. I also learned about the functionalities in a vehicle control center here. Since self-driving cars are still a relatively new concept, passengers might feel a bit confused on how to operate these new cars. How can we make sure that users can feel confident when operating a self-driving car? The lack of user control in self-driving cars may cause many passengers to be highly skeptical about the car's safety. How can we make sure that we establish trust with our passengers and make them feel safe? 1. Before car ride: passenger wants to adjust car controls to prepare for the car ride. Designing with the user journey in mind, I was able to quickly mock up some designs mapping out control system that accommodated the user's need at every stage. Shown below are my sketches from my second iteration, along with a quick user flow indicating how these screens interact with each other. It's important to give visual and audio feedback informing the passengers of everything that is happening in the car. Having this transparency will help passengers have a sense of control in a self-driving car. Assuming the control center will be in the same position as traditional in-car interfaces (between the driver and passenger seat), all passengers in the car will be able to get a glimpse of what the car is up to. Knowing the difficulty of inputing addresses on a GPS, I took the time to redesign the keyboard as well as provided an option for voice input. To further streamline the process of inputing the destination, top recommendations are shown to passengers so that they can get to where they want to go with just one tap. Traditional cars control center UIs have tactile input and haptic feedback so that drivers can change settings without needing to take their eyes off of the road. Although passengers in self-driving cars don't technically need the same designs, tactile input should still be put in place for muscle memory. Traditional car control center UIs will feel intuitive and most car owners will understand how to use it from the very start. 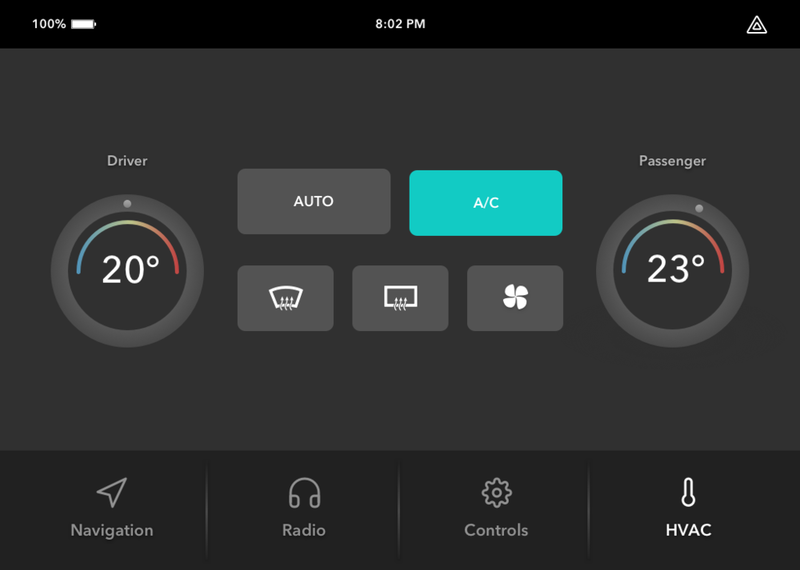 For the example of the HVAC controls, I designed a simplified version of the on/off button and thermostat knobs while keeping the traditional hardware design so that it feels familiar to our users. Since the passengers are not driving, it might be a difficult task for them to remember to turn on the car controls at the right time. Assuming the car is able to detect the weather and make smart suggestions on which controls needed to be turned on, we can help remind users on what to keep in mind. In the case of making sure that the passengers feel in control, I designed this feature so that it suggests a certain control instead of automatically turning on controls without the passenger's permission.